Occurrence of sporadic super-knock is the main obstacle in the development of advanced gasoline engines. By utilizing a rapid compression machine, events of pre-ignition and super-knock in a closed system under high temperature and high pressure were captured by synchronous high-speed direct photography and pressure measurement. Two different types of engine super-knock could exist. The first type is the super-knock induced by pre-ignition followed by deflagration of the end-gas. This type of super-knock is quite similar to conventional knock and usually causes moderate pressure oscillation. The second type of super-knock exhibits significantly higher magnitude of pressure oscillation than that of the first type due to the detonation of the end-gas. The second type of super-knock is designated as ‘‘Deto-knock’’. Three conditions must coexist for deto-knock to occur. First, pre-ignition triggers the combustion. Second, end-gas pressure and temperature are high enough to cause detonation. Third, local hot-spot exists in the end-gas that triggers the detonation of the end-gas. 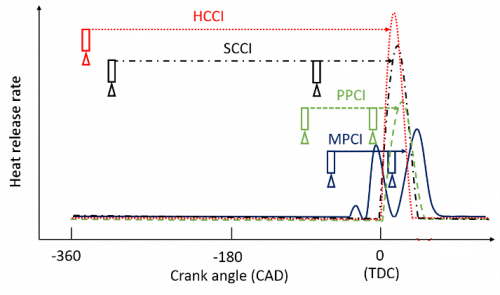 The mechanism of deto-knock could be described as hotspot-induced deflagration followed by hot-spot-induced detonation in the end-gas. 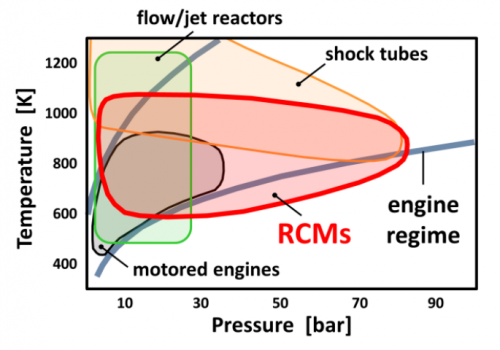 The above mechanism obtained in the RCM can also be used to explain the phenomena of super-knock in boosted gasoline engines, as shown in the following Figure. 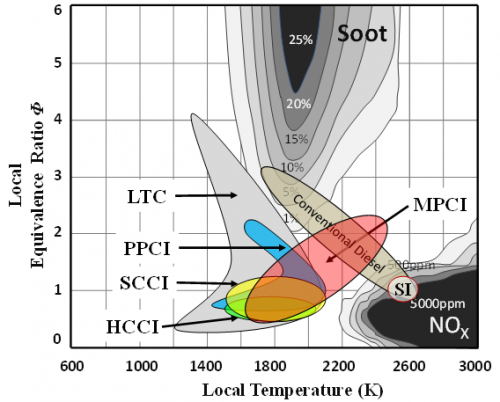 First, pre-ignition occurs before TDC due to a local hot-spot (oil, deposit, oil-gasoline, etc.) in the combustion chamber during the compression stroke. 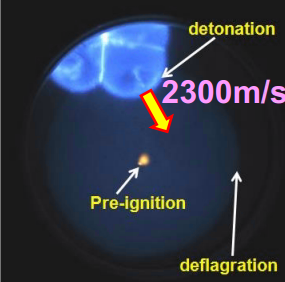 A pre-ignition-triggered flame propagates from the hot-spot to the rest of the mixture. Then, the spark ignition occurs, and the 2nd flame front may propagate if the spark ignition is in an unburned zone. The rapid expansion of the burned gas rapidly compresses the unburned mixture to higher temperature and pressure (about 1000 K, 10 MPa). Finally, a second hotspot (or multiple hot-spots) in the end gas induces the detonation of the un-burned mixture at high temperature and high pressure. 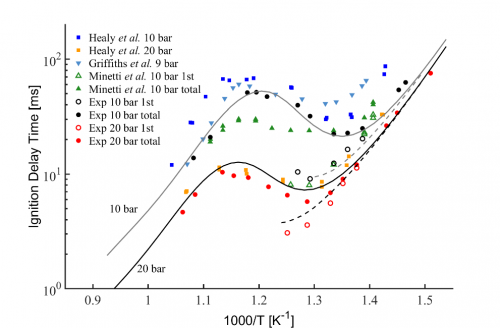 As the timing of the “hot spot” combustion in the unburned mixture is crucial to detonation, this mechanism also helps to explain why an earlier pre-ignition does not always lead to a higher knock intensity. If the “hot spot” appears too early, the in-cylinder pressure and temperature are relatively low. It may turn out to be a deflagration, similar to the combustion processes in the 1st stage. 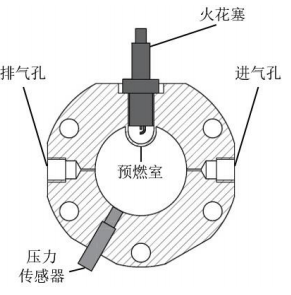 If the “hot spot” appears too late, the majority of the mixture has already been consumed by the deflagration, and pressure tends to decrease with the downward movement of the piston. As a result, the pressure rise and pressure oscillation will be smaller. If the “hot spot” starts near TDC, it is likely to trigger detonation under high pressure and high temperature conditions. 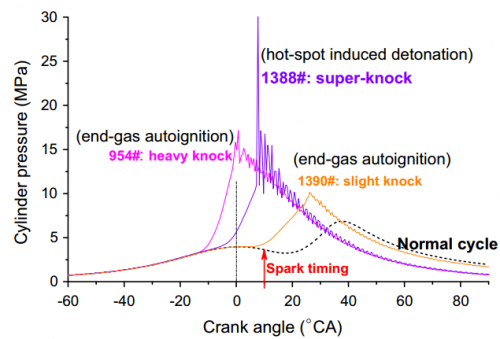 The energy density of the unburned end-gas mixture at the onset of knock was identified as a criterion for super-knock. For gasoline fuel in the test engine, when the energy density of the unburned end-gas mixture exceeded 30 MJ/m3, super-knock was always observed. For lower energy densities, knock or non-knock was observed. Y. Qi, Y. Xu, Z. Wang, J. Wang, The effect of oil intrusion on super knock in gasoline engine, SAE Technical Papers (2014). Z. Wang, H. Liu, T. Song, Y. Xu, J.X. Wang, D.S. Li, T. Chen, Investigation on pre-ignition and super-knock in highly boosted gasoline direct injection engines, SAE Technical Papers (2014). Z. Wang, F. Wang, S.J. Shuai, Study of Engine Knock in HCCI Combustion using Large Eddy Simulation and Complex Chemical Kinetics, SAE Technical Papers (2014). Z. Wang, H. Liu, T. Song, Y. Qi, X. He, S. Shuai, J. Wang, Relationship between super-knock and pre-ignition, International Journal of Engine Research 16 (2015) 166-180. Z. Wang, Y. Qi, X. He, J. Wang, S. Shuai, C.K. Law, Analysis of pre-ignition to super-knock: Hotspot-induced deflagration to detonation, Fuel 144 (2015) 222-227. Y. Qi, Z. Wang, J. Wang, X. He, Effects of thermodynamic conditions on the end gas combustion mode associated with engine knock, Combustion and Flame 162 (2015) 4119-4128. Z. Wang, H. Liu, R.D. Reitz, Knocking combustion in spark-ignition engines, Progress in Energy and Combustion Science 61 (2017) 78-112. Z. Wang, Y. Qi, H. Liu, P. Zhang, X. He, J. Wang, Shock wave reflection induced detonation (SWRID) under high pressure and temperature condition in closed cylinder, Shock Waves 26 (2016) 687-691. Xiang S, Qi Y, Wang Z, Wang J. 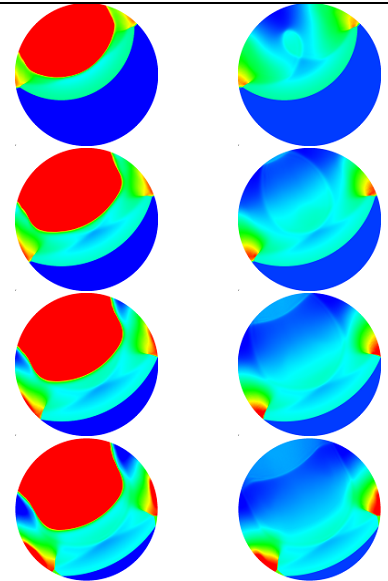 Numerical simulation of detonation initiation induced by shock wave reflection in a rapid compression machine (in Chinese). Sci Sin Tech 2016;46:1287–95. Y. Wang, Y. Qi, S. Xiang, R. Mével, Z. Wang, Shock wave and flame front induced detonation in a rapid compression machine, Shock Waves 28 (2018) 1109-1116. Han W, Gao Y, Law CK. 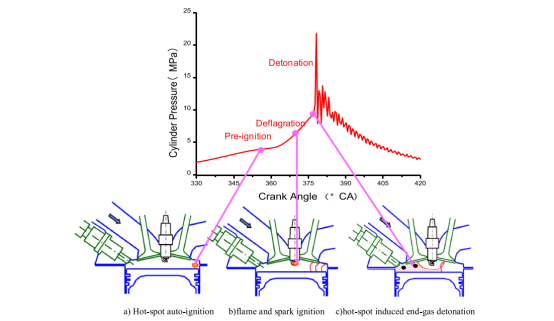 Flame acceleration and deflagration-to-detonation transition in micro-and macro-channels: An integrated mechanistic study. Combustion and Flame. 2017, 176:285-98. 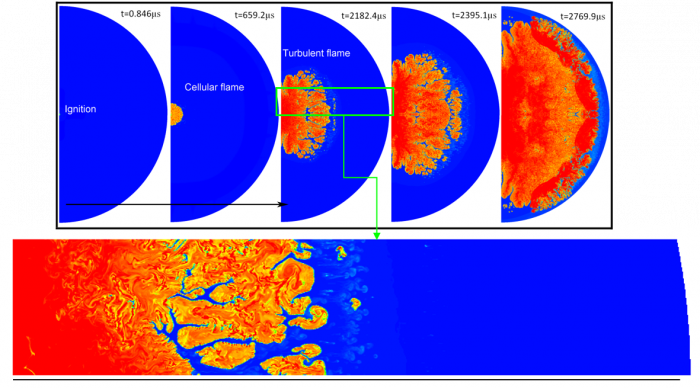 Han WH, Huang J, Du N, Liu ZG, Kong WJ, Wang C. Effect of Cellular Instability on the Initiation of Cylindrical Detonations. Chinese Physics Letters. 2017, 34(5):054701. Shubo Fei, Yuliang Qi, Yanfei L, Zhi Wang, et al. 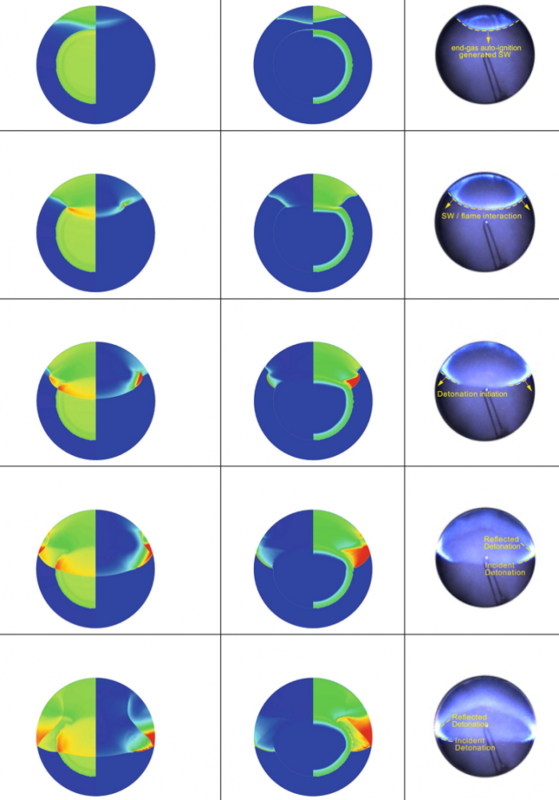 The Finite Heat Conduction Model of Single Droplet Combustion and its Verification. 26th ICDERS. 2017, Boston, MA, USA. Shubo Fei, Zhi Wang, Yunliang Qi, Yingdi Wang, Huiqiang Zhang. Ignition of a Single Lubricating Oil Droplet in Combustible Ambient Gaseous Mixture under High-Temperature and High-Pressure Conditions. Combustion Science and Technology. 2018. Shubo Fei, Zhi Wang, Yunliang Qi, Yingdi Wang. Investigation on Ignition of a Single Lubricating Oil Droplet in Premixed Combustible Mixture at Engine-Relevant Conditions. SAE Technical Paper. 2019-01-0298. Shubo Fei, Yingdi Wang, Yunliang Qi, Zhi Wang, Huiqiang Zhang. 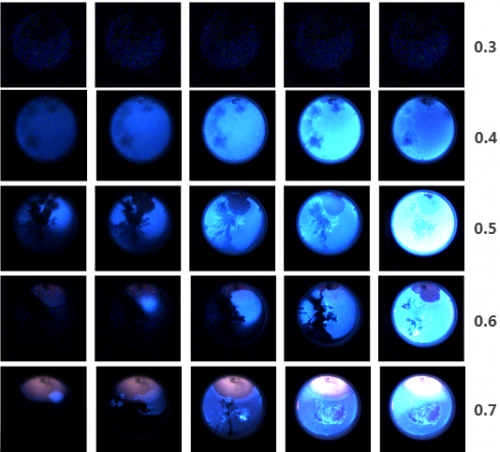 Investigation on explosion of lubricating oil droplet during combustion of ambient gaseous mixture under high pressure and temperature conditions. 15th International Conference on Flow Dynamics. 2018. Sendai, Miyagi, Japan. Tanjin He, Shuang Li, Yawei Chi, Hong-Bo Zhang, Zhi Wang, Bin Yang, Xin He, Xiaoqing You. An adaptive distance-based group contribution method for thermodynamic property prediction. Physical Chemistry Chemical Physics, 2016, 18:23822-23830. Shuojin Ren, Sage L Kokjohn, Zhi Wang, Haoye Liu, Buyu Wang, Jianxin Wang. A multi-component wide distillation fuel (covering gasoline, jet fuel and diesel fuel) mechanism for combustion and PAH prediction. Fuel, 2017, 208:447-468. Li Li, Jianxin Wang, Zhi Wang et al. Combustion And Emissions Of Compression Ignition in a Direct Injection Diesel Engine Fueled with Pentanol. Energy 2015 (80):575-581. 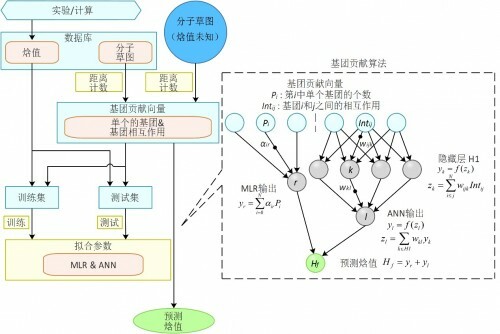 Li Li, Jianxin Wang, Zhi Wang et al. Combustion And Emission Characteristics of Diesel Engine Fueled with Diesel/Biodiesel/Pentanol Fuel Blends. Fuel 2015(156):211-218. Haoye Liu, Zhi Wang, Jun Zhang, et al. Study on combustion and emission characteristics of PODE/diesel blends in light-duty and heavy-duty diesel engines. Applied Energy 2017, 185: 1393-1402. 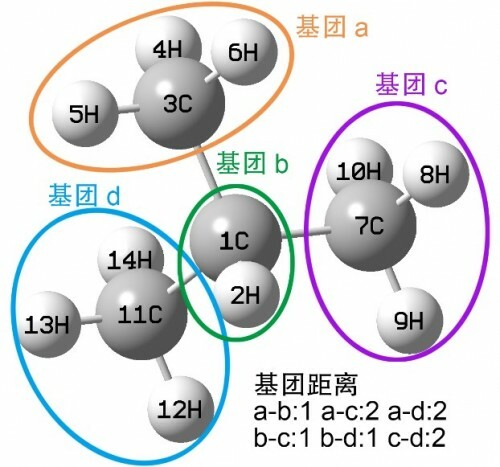 Jianxin Wang, Fujia Wu, Jianhua Xiao, et al. Oxygenated blend design and its effects on reducing diesel particulate emissions. Zhi Wang, Li Li, Jianxin Wang. 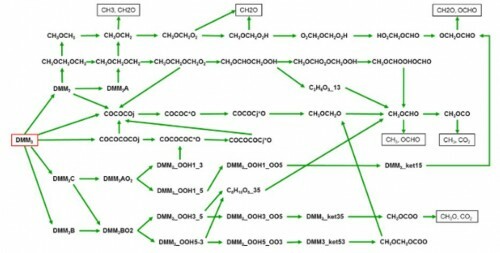 Effect of Biodiesel Saturation on Soot Formation in Diesel Engines. Fuel,2016,175:240-248. Zhi Wang, Haoye Liu, Xiao Ma, Jianxin Wang, Shijin Shuai, Rolf D. Reitz. Homogeneous charge compression ignition (HCCI) combustion of polyoxymethylene dimethyl ethers (PODE). Fuel, 2016, 183: 206–213. Haoye Liu, Zhi Wang, Jianxin Wang, Xin He, Yanyan Zheng, Qiang Tang. Performance, combustion and emission characteristics of a diesel engine fueled with polyoxymethylene dimethyl ethers (PODE3-4)/diesel blends. Energy, 2015, 88: 793-800. Haoye Liu, Xiao Ma, Bowen Li, Longfei Chen, Zhi Wang, Jianxin Wang. Combustion and emission characteristics of a direct injection diesel engine fueled with biodiesel and PODE/biodiesel fuel blends. Fuel, 2017, 209:62-68. Tanjin He, Haoye Liu, Yingdi Wang, Boyuan Wang, Hui Liu, Zhi Wang. Development of Surrogate Model for Oxygenated Wide-Distillation Fuel with Polyoxymethylene Dimethyl Ether. SAE Technical Paper 2017-01-2236, 2017. Z. Wang, F. Li, and Y. Wang. "A generalized kinetic model with variable octane number for engine knock prediction." Fuel 188(2017):489-499. H. Di, X. He, P. Zhang, Z. Wang, M.S. Wooldridge, C.K. 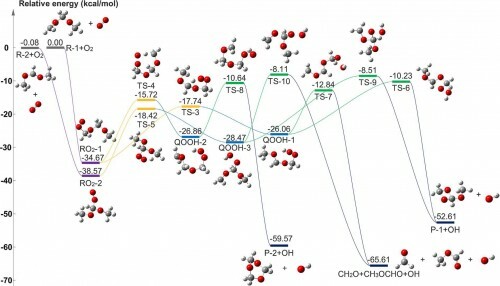 Law, C. Wang, S. Shuai, J. Wang, Effects of buffer gas composition on low temperature ignition of iso-octane and n-heptane, Combustion and Flame 161 (2014) 2531-2538. W. Ji, P. Zhang, T. He, Z. Wang, L. Tao, X. He, C.K. Law, Intermediate species measurement during iso-butanol auto-ignition, Combustion and Flame 162 (2015) 3541-3553. P. Zhang, W. Ji, T. He, X. He, Z. Wang, B. Yang, C.K. 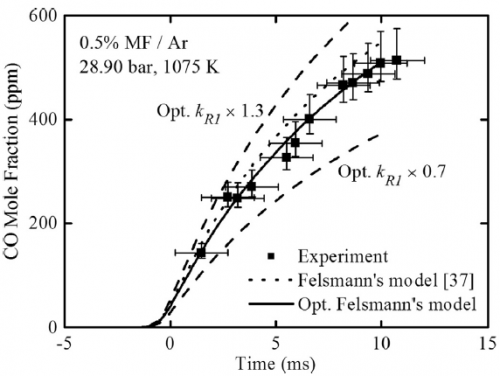 Law, First-stage ignition delay in the negative temperature coefficient behavior: Experiment and simulation, Combustion and Flame 167 (2016) 14-23. Y. Wang, Y. Li, Z. Wang, X. He, Hydrogen formation from methane rich combustion under high pressure and high temperature conditions, International Journal of Hydrogen Energy 42 (2017) 14301-14311. 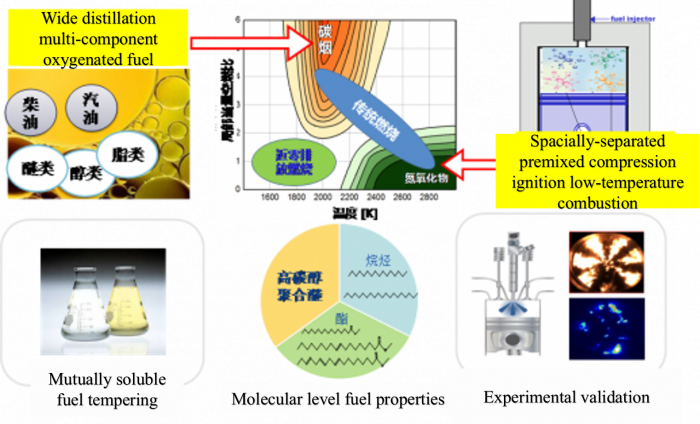 Fan, Q., Wang, Z., Qi, Y., Wang, Y. et al., "Experimental Study of Lean Mixture Combustion at Ultra-High Compression Ratios in a Rapid Compression Machine," SAE Technical Paper 2018-01-1422, 2018. Fan, Q., Qi, Y., and Wang, Z., "Effect of Thermodynamic Conditions on Spark Ignition to Compression Ignition in Ultra-Lean Mixture Using Rapid Compression Machine," SAE Technical Paper 2019-01-0963, 2019. H.Q. Yang, S.J. Shuai, Z. Wang, et al. High Efficiency and Low Pollutants Combustion: Gasoline Multiple Premixed Compression Ignition (MPCI). SAE Technical Paper (2012). H.Q. Yang, S.J. Shuai, Z. Wang, et al. Fuel Octane Effects on Gasoline Multiple Premixed Compression Ignition (MPCI) Mode. Fuel, 2013, 103:373-379. H.Q. Yang, S.J. Shuai, Z. Wang, et al. Parameter Study of Common Rail Pressure for Low Octane Gasoline Multiple Premixed Compression Ignition (MPCI) in Light-duty Diesel Engine. Journal of Automobile Engineering, 2013, 227(2):272-280. H.Q. Yang, S.J. Shuai, Z. Wang, et al. Gasoline Multiple Premixed Compression Ignition (MPCI): Controllable, High Efficiency and Clean Combustion Mode in Direct Injection Engines. International Journal of Automotive Technology, 2013, 14(1):19-27. H.Q. Yang, S.J. Shuai, Z. Wang, et al. New Premixed Compression Ignition Concept for Direct Injection IC Engines Fueled with Straight-run Naphtha. Energy Conversion and Management, 2013, 68:161-168. H.Q. Yang, S.J. Shuai, Z. Wang, et al. Comparative Study of Low Octane Gasoline Multiple Premixed Compression Ignition and Conventional Diesel Combustion. Combustion Science and Technology, 2013, 185(4): 564-578. H.Q. Yang, S.J. Shuai, Z. Wang, et al. Performance of Straight-run Naphtha Single and Two-stage Combustion Modes from Low to High Load. International Journal of Engine Research, 2013, 14(5): 469-478. H.Q. Yang, S.J. Shuai, Z. Wang, et al. Effect of Injection Timing on PPCI and MPCI Mode Fueled with Straight-run Naphtha. Journal of Engineering for Gas Turbines and Power, 2013, 136(3): 031501. H.Q. Yang, Z. Wang, S.J. Shuai, et al. Temporally and spatially distributed combustion in low-octane gasoline multiple premixed compression ignition mode. Applied Energy, 2015, 150: 150-160. Wang Buyu, Wang Zhi, Shuai Shijin, et al. 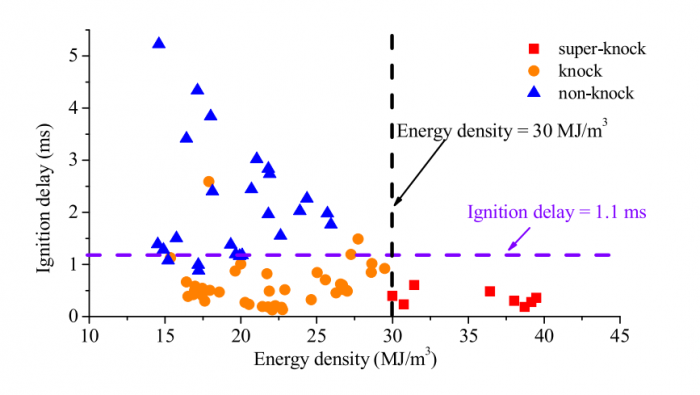 Combustion and emission characteristics of Multiple Premixed Compression Ignition (MPCI) fuelled with naphtha and gasoline in wide load range. Energy Conversion and Management. 2014, 88(12):79-87. Wang Buyu, Wang Zhi, Shuai Shijin, et al. 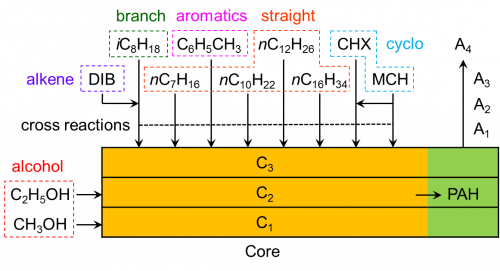 Combustion and emission characteristics of Multiple Premixed Compression Ignition (MPCI) mode fuelled with different low octane gasolines. Applied Energy. 2015, 160:769-776. Wang B, Yang H Q, Shuai S J, et al. Numerical resolution of multiple premixed compression ignition (MPCI) mode and partially premixed compression ignition (PPCI) mode for low octane gasoline. SAE Technical Paper, 2013. Wang B, Shuai S J, Yang H Q, et al. Experimental Study of Multiple Premixed Compression Ignition Engine Fueled with Heavy Naphtha for High Efficiency and Low Emissions. SAE Technical Paper, 2014. Wang B, Wang Z, Shuai S J, et al. Investigations into Multiple Premixed Compression Ignition Mode Fuelled with Different Mixtures of Gasoline and Diesel. SAE Technical Paper, 2015. Wang B, Wang Z, Shuai S, et al. Extension of the Lower Load Limit in Dieseline Compression Ignition Mode. Energy Procedia, 2015, 75: 2363-2370. Kim K, Wang Z, Wang B, et al. Load expansion of naphtha multiple premixed compression ignition (MPCI) and comparison with partially premixed compression ignition (PPCI) and conventional diesel combustion (CDC). Fuel, 2014, 136: 1-9. Liu H, Wang Z, Li B, et al. Exploiting new combustion regime using multiple premixed compression ignition (MPCI) fueled with gasoline/diesel/PODE (GDP). Fuel, 2016, 186: 639-647. 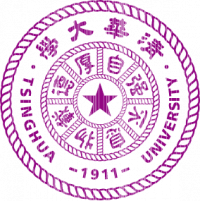 Yu L, Shuai S, Li Y, et al. An experimental investigation on thermal efficiency of a compression ignition engine fueled with five gasoline-like fuels. Fuel, 2017, 207: 56-63. The Chinese 973 project No. 2013CB228404 "Low Temperature Combustion for Wide Distillation Fuel by Controlling of Mixing Rate and Reaction Rate", proposed to improve emissions with oxygenated wide distillation fuel: combining the advantage of gasoline and diesel fuel, blending high-volatilility low-carbon component with high-ignitability high-carbon component, can increase air-fuel mixing rate and control combustion rate. By adding oxygenated fuel, combustion and emission characteristics can be further improved. Meanwhile, the energy conversion efficiency of gasoline is also increased. By using oxygenated fuel(coal based fuel: Polyoxymethylene dimethyl ethers, PODEn/DMMn; biofuel: pentanol) to temper gasoline and diesel blends, WDF exhibits high volatility, high ignitability and high oxygen content, leading to low soot emissions. By combining low temperature combustion reducing NOx, the trade-off between NOx and soot emissions is broken, soot emissions are reduced by 90-99%, and NOx emissions are reduced by 90%. 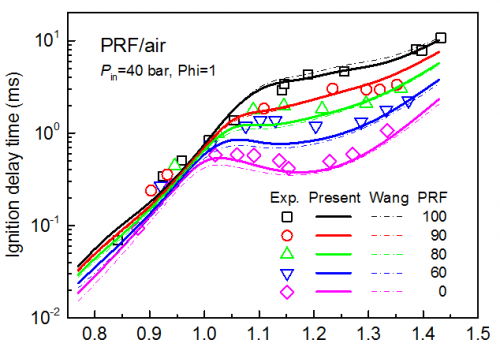 By further combining oxygenated WDF and spatially-seperated premixed compression ignition mode, fuel combustion occurs in different regions of the combustion chamber, breaking down the trade-off between thermal efficiency and pressure rise rate. Fuel consumption can be reduced by 5-10% under similar pressure rise rate. Haoye Liu, Zhi Wang, Jianxin Wang, Xin He. 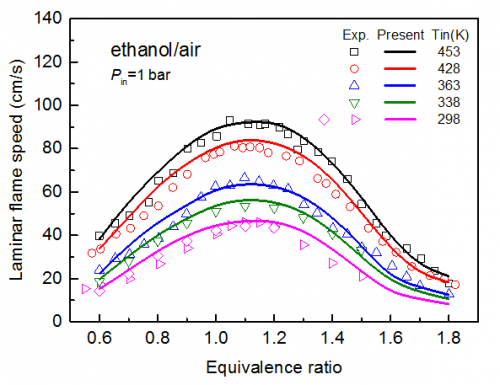 Effects of gasoline research octane number on premixed low-temperature combustion of wide distillation fuel by gasoline/diesel blend. Fuel, 2014, 134: 381–388. Jianxin Wang, Zhi Wang, Haoye Liu. Combustion and emission characteristics of direct injection compression ignition engine fueled with Full Distillation Fuel (FDF). Fuel, 2015, 140: 561–567. Haoye Liu, Zhi Wang, Jianxin Wang. Performance, Combustion and Emission Characteristics of Polyoxymethylene Dimethyl Ethers (PODE3-4)/ Wide Distillation Fuel (WDF) Blends in Premixed Low Temperature Combustion (LTC). SAE Int. J. Fuels Lubr. 8(2):2015, doi:10.4271/2015-01-0810. Haoye Liu, Zhi Wang, Jianxin Wang, Xin He. Improvement of emission characteristics and thermal efficiency in diesel engines by fueling gasoline/diesel/PODEn blends. Energy, 2016, 97: 105-112. Haoye Liu, Zhi Wang, Bowen Li, Shijin Shuai, Jianxin Wang. 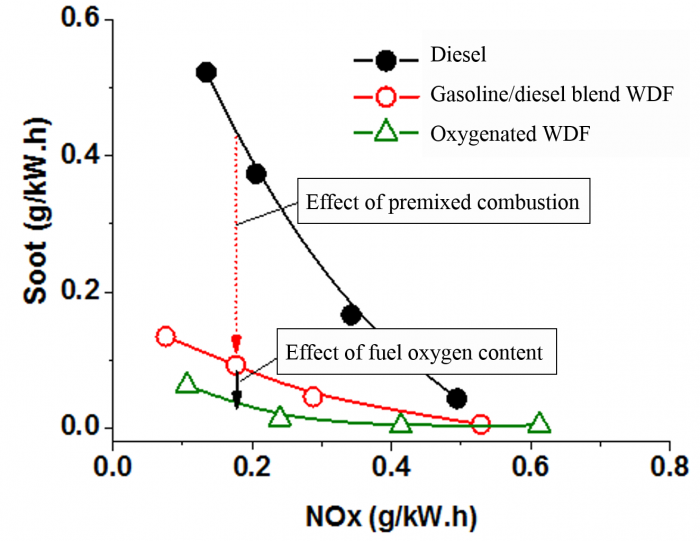 Combustion and Emission Characteristics of WDF in a Light-Duty Diesel Engine Over Wide Load Range. SAE Technical Paper 2017-01-2265, 2017. Liu Haoye, Wang Zhi, Zhang Jun, et al. Study on combustion and emission characteristics of PODE/diesel blends in light-duty and heavy-duty diesel engines. Applied Energy 2017, 185: 1393-1402. Hybrid technology is a significant method to save energy and reduce emissions. 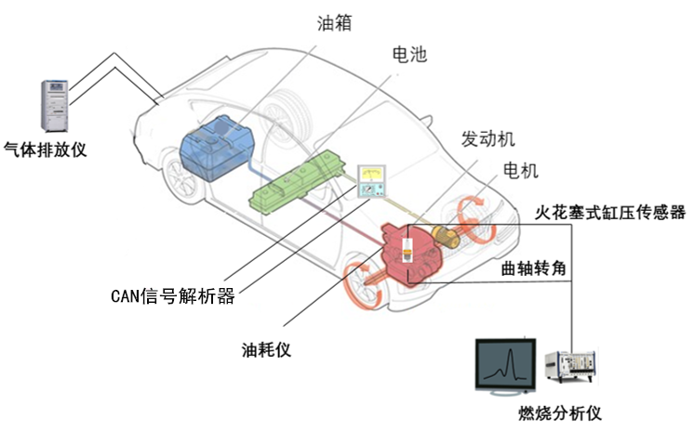 However, hybrid system mainly focuses on the development of electrical components and vehicle energy management while the engine used in the system is based on the conventional engine or its recalibration, which is not the real hybrid system. On the other hand, in order to further cut down the fuel consumption of the HEVs/PHEVs, advanced and innovative technology for engines is essential. Therefore, forward development of dedicated hybrid engines matching with the vehicle configuration and optimization of engine itself play an important role in meeting the requirement of longer term fuel consumption and emission regulations. The premise of forward development of dedicated hybrid engines is to learn about the characteristics and control strategy of advanced hybrid engines around the world. Currently, based on the method called THU-CPS, the strategies of spray, spark, start-stop, and engine roles in the powertrain have been analyzed in detail, which is the significant reference for developing the control strategy of dedicated hybrid engines. LabXing make you forget about hassle with design and maintenance of lab homepage.